Nissan catches up to the competition. Introduced in 2004, the Titan gave Nissan its first full-size truck. That move trumped Nissan’s arch-rival, Toyota, which was still three years away from bringing a larger and more robust Tundra to the market. But an odd thing happened along the way — Nissan didn’t make many changes and stayed with the first-generation Titan for 12 years, an uncommonly long term in a segment where customers demand change as often as they upgrade their trucks. Not only was Nissan eventually overtaken by Toyota, but the automaker offered little reason for GMC Sierra, Ford F-150, Ram 1500 or Chevrolet Silverado customers to make a switch, let alone Tundra owners. Languishing models are often canceled, but Nissan would have none of that. Enter the second-generation 2017 Nissan Titan after a one-year hiatus. The 2017 Nissan Titan is based on an all-new ladder frame and features an updated V8 gasoline engine paired with a seven-speed automatic transmission. The Titan’s first-ever regular cab will arrive later in the year as will a V6 engine. Currently, only cab models are available along with a five-foot, seven-inch bed. Four crew cab trim levels are available: S ($34,780), SV ($37,670), SL ($46,380), and Platinum Reserve ($52,310). Add upwards of $3,090 to upgrade to four-wheel drive from rear-wheel drive. A fifth model, the four-wheel-drive-only PRO-4X retails for $45,020. Prices exclude a $1,195 destination charge. Prices for regular cab models are pending. 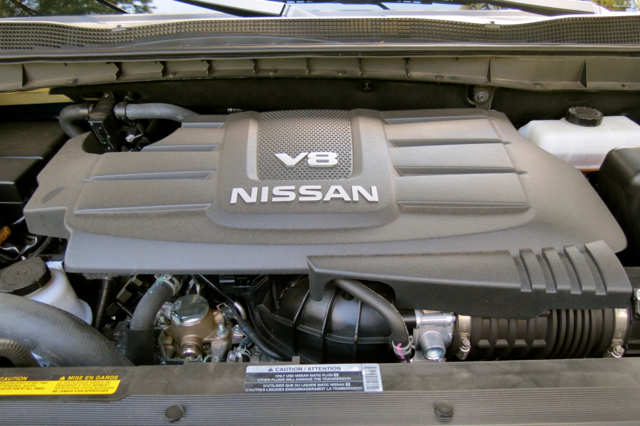 As for the crew cab, the 5.6-liter V8 gasoline engine will do, the latest generation of Nissan’s largest engine. Nissan calls the current version “Endurance” and says it makes 390 horsepower and 394 pound-feet, for a marked improvement over the previous engine’s 317 horsepower and 385 pound-feet of torque. Swapping out the previous five-speed transmission with a seven-speed automatic is helping matters too — the new truck now makes an EPA-estimated 15 mpg in the city and 21 mpg on the highway compared with the previous 13 mpg in the city and 18 mpg on the highway. More power and improved fuel economy represent a desirable and winning combination. 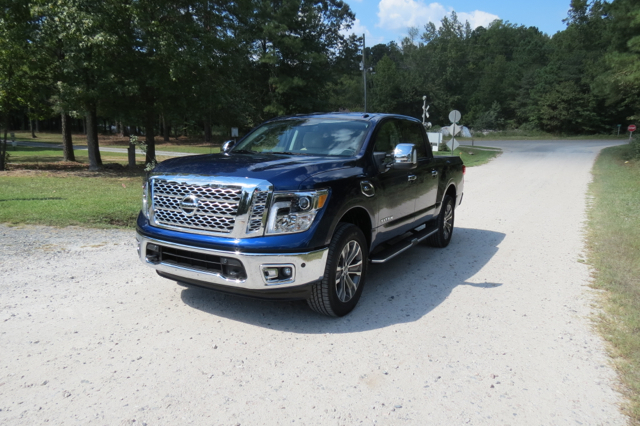 Full-size pickup trucks advance a formidable look and in this department the 2017 Titan nails it. Designed by Nissan’s California design studio, the new truck has been aerodynamically enhanced thanks to a front spoiler, roof and tailgate spoilers, and a front tow hook cover hole. Other changes benefiting this truck’s slipperiness include an active grille shutter, underbody covers, rear tire wind deflectors, and a seal between the cab and the bed. Nissan’s take on big truck burliness varies depending on the model chosen. On our tested SL 4×4 edition, chrome was liberally used to cover the grille, surround the bumpers, and to embellish the side mirrors. This model is marked by large vent port ornamentation, side steps, and handsome alloy wheels. 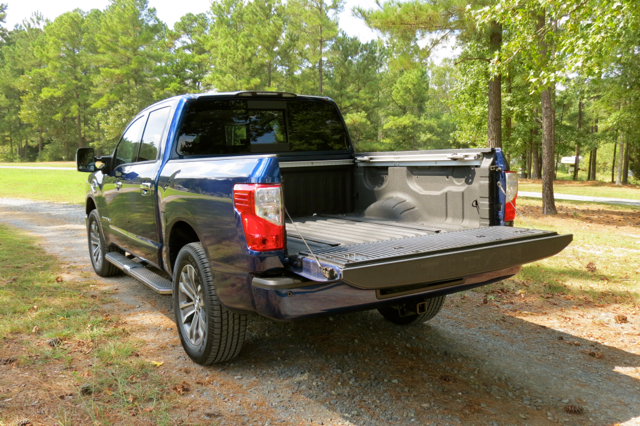 From the rear, you’ll find a center step bumper and a bed rail system with four fixed tie-down hooks and four available and moveable aluminum cleats. The available dual lockable Titan Box storage boxes are a worthwhile upgrade, sitting on the inside of the bed along each wall. Fully drainable, the boxes are also removable. A 110-volt outlet is available at the SV level and is standard with the SL. 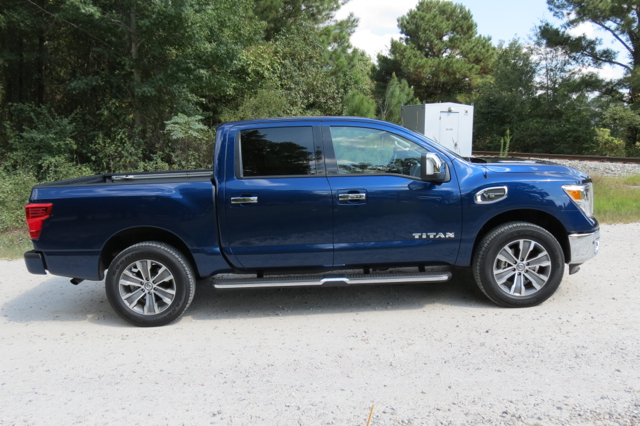 Crew cabs offer excellent room for five, but in both the Titan S and SV models you can squeeze in a sixth person as these are the only models with a 40-20-40 front split bench seat. Otherwise, you’ll find a pair of captain’s chairs up front. In the S, you can use the middle position in a pinch or fold it down to access the armrest, two cup holders, and storage space. The base model also comes with a vinyl floor and cloth seats with a vinyl bolster — ideal for fleet shoppers. The rear seat folds up (down in the PRO-4X), revealing an available lockable in-floor storage compartment. Standard equipment includes remote keyless entry with a push-button ignition, air conditioning, a column shifter with manual shift mode, cruise control with steering wheel-mounted controls, power windows, six cup holders, eight drink holders, rear reading lights, a pair of 12-volt outlets, an auxiliary audio input jack, and USB ports. Upgrades, depending on the chosen trim, bring in a power tilt and telescopic steering column, leather seats, heated and cooled front seats, power driver and front passenger seats, a power sliding rear window, and footwell lamps. 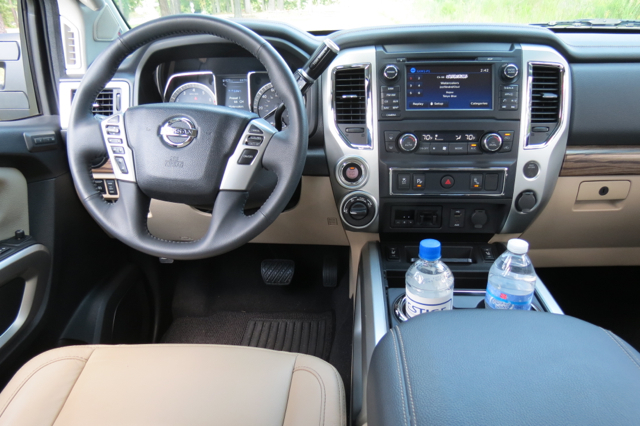 Available technologies include NissanConnect with Navigation, a seven-inch color touch-screen display, SiriusXM Traffic and Sirius Travel Link, Siri Eyes Free, and Nissan Voice Recognition for navigation and audio. Upgrades at the SL grade bring in a 12-speaker Rockford Fosgate Premium audio system, remote engine start, and advanced NissanConnect Services such as automatic collision notification with an emergency call. When it comes to safety, the sheer size of the Titan is its strongest attribute. Nevertheless, this truck provides blind spot warning, rear cross traffic alert, and a rearview monitor. At the Platinum Reserve level, an around-view monitor is added. Neither the National Highway Traffic Safety Administration nor the Insurance Institute for Highway Safety (IIHS) has crash-tested the 2017 Titan as of publication. A large truck requires a big V8, right? Well, some manufacturers offer V6s and this model will gain a 3.5-liter V6 later in the year. The Endurance V8 does an excellent job of moving this near 5,700-pound 4×4. Around town, the engine is quiet, but press hard on the accelerator and it bellows. It is matched well with the transmission, although we noticed downshifts are at times slow in coming when passing on the highway. Maximum towing capacity tops 9,390 pounds in the 4×2 (9,230 pounds in the 4×4). 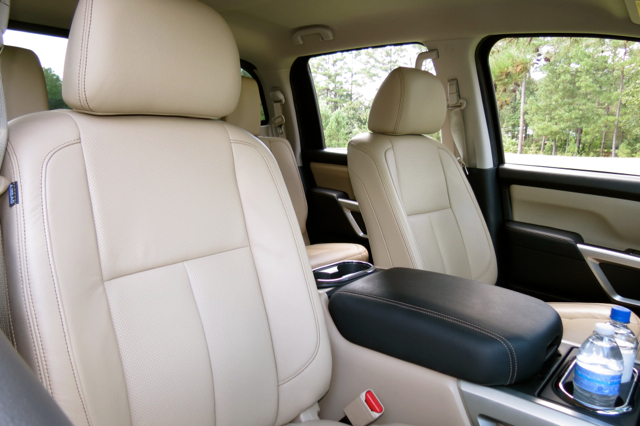 The ride is comfortable and you’ll feel that you’re in command when driving. The Nissan Titan matches well against the domestics, including the Toyota. Far more truck shoppers want a crew cab than a regular cab, so the Titan’s best cab configuration is already here. The Endurance engine will suit most buyers fine, while the V6 might best be used in a regular cab work truck. For off-road enthusiasts, the PRO-4X model is the complete package, offering Bilstein mono-tube off-road shocks, all-terrain off-road tires, and various exterior and interior embellishments, including two-tone paint, branded floor mats, and PRO-4X embroidery. It isn’t quite the “western” theme found in competing trucks, but it supplies a desirable sporting flair nonetheless. Otherwise, the SV edition offers excellent bang for the buck, with the 4×4 version coming in around $45,000 with utility ($1,120), towing ($495), and comfort & convenience ($2,040) packages included. Discounting and other incentives should lower your final price further.